The Brookings Institution's Célia Belin, an expert on transatlantic relations and U.S. foreign policy toward Europe, and Alina Polyakova, an expert on European politics and far-right populism and nationalism, join James M. Lindsay to discuss U.S.-European relations. Trade disputes on the docket at the G7 summit, anticipation of a meeting between President Donald J. Trump and Kim Jong-un builds, and the World Cup kicks off in Russia. 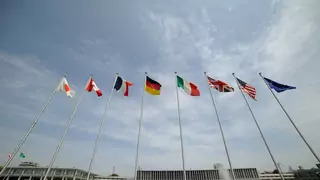 The G7 Summit takes place in Brussels; Syria holds presidential elections; and the world marks the 25th anniversary of the Tiananmen Square crackdown. World powers convene in The Hague for a nuclear summit; the Group of Seven discusses Ukraine; EU-U.S. trade talks resume in Brussels; and President Barack Obama travels to Italy and Saudi Arabia.